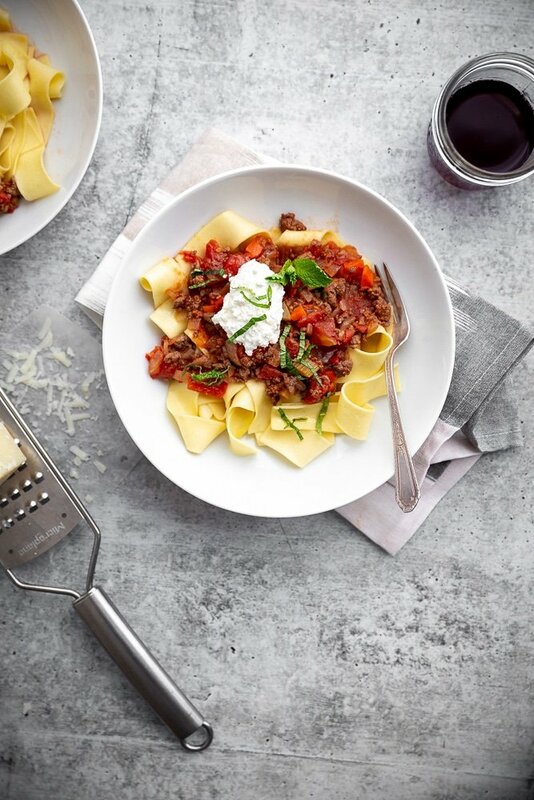 This lamb ragu is one of my favorite meals EVER. I first fell in love with it when Ella was born. My mom flew out to help us for a couple of weeks, spoiling us with her cooking and cleaning. One sunny Saturday in March she made a long-simmered lamb ragu, which we happily devoured while watching the wonder-of-Ella bobbing gently in her swing. It was one of life’s perfect moments. Lamb ragu will forevermore have special place in my heart, although I suspect I would love it just as much even without the memories attached. 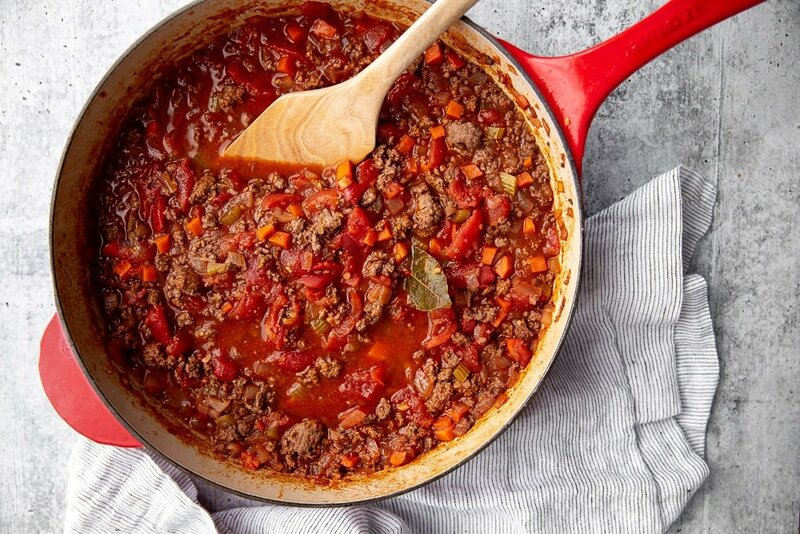 While my mom’s ragu simmered for hours, I’ve concocted a quick version that can be thrown together any night of the week—with a baby strapped into a carrier on your chest, or with toddler crawling through your kitchen cabinets, or with a nine-year-old helping you at the stove. Every March, right about the time when I can’t bear the thought of another Brussels sprout but asparagus and morels are still weeks away, I crave this dish. 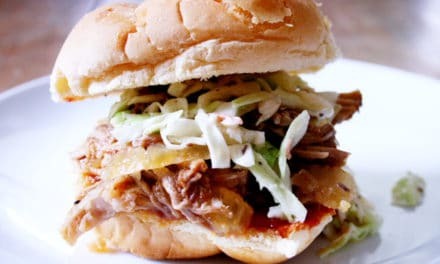 It tastes like springtime, but uses easy-to-find ingredients. The ragu simmers for only 15-20 minutes but has a cooked-all-day taste due to a few simple techniques. First, the meat gets browned before the other ingredients are added. 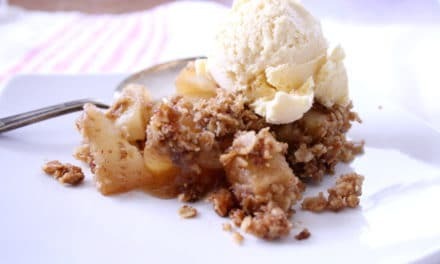 This gives it a jump-start and creates a rich flavor (all those brown bits on the bottom of the pan equal flavor!). A second benefit to browning the meat first is that you can drain off all the fat, resulting in a much lighter, non-greasy sauce. 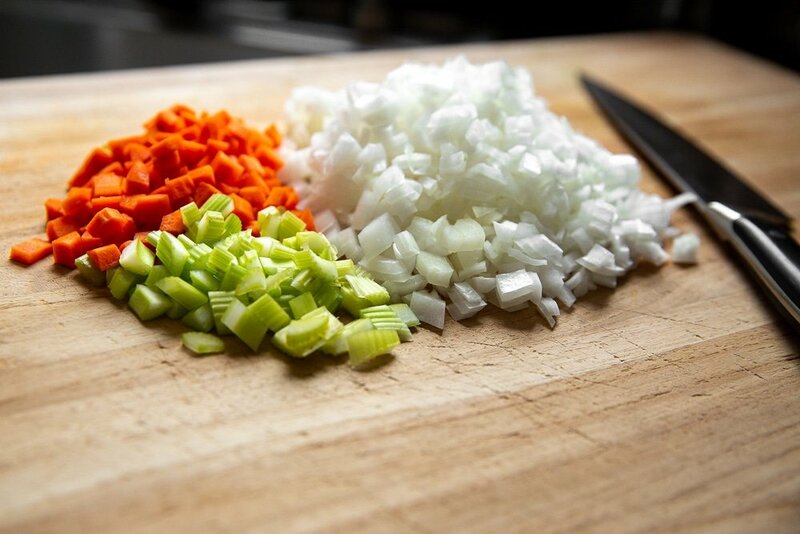 The second trick is to finely chop the vegetables so that they cook quickly (this is key). And finally, the sauce is layered with simple ingredients that create a long-simmered flavor, such as tomato paste for umami sweetness, wine for brightness and a touch of cinnamon for warmth. The ragu gets tossed with papperdelle pasta (or any pasta shape of your choice) and is showered with grated Pecorino Romano and fresh mint. 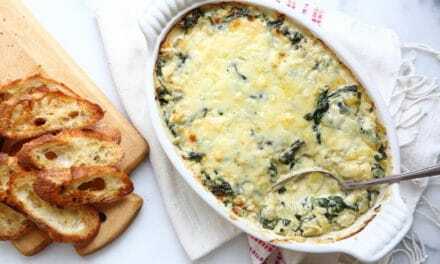 A dollop of creamy ricotta cheese (use the good stuff, nothing with gums or fillers!) adds luxurious creaminess. It’s comforting and yet bright, warming yet light—the perfect meal any time of year. 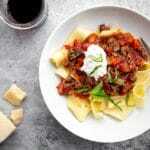 This ragu simmers for only 15-20 minutes, but has a cooked-all-day taste. Make sure to chop the vegetables nice and small so that they cook quickly and evenly. 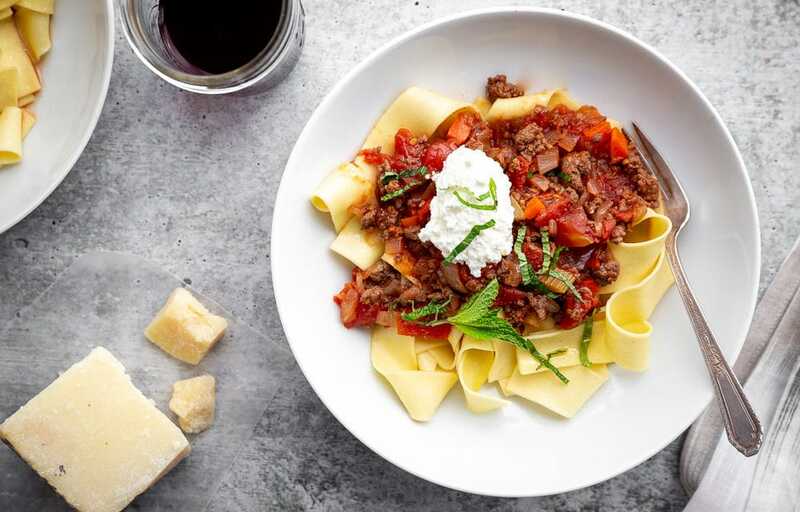 The ragu gets served with papperdelle pasta (but any pasta shape will do—penne is another personal favorite) and is showered with grated Pecorino, a sprinkle of fresh mint and a dollop of creamy ricotta (be sure to use a good quality fresh ricotta, nothing with gums or fillers). It’s comfort food at its most elegant and easy. The ragu also makes for a fabulous lasagna when layered with goat cheese, lasagna noodles, spring peas and Pecorino. If you have the time, make the ragu in the morning or the day before—it only gets better as it sits. In a large straight-sided skillet, heat 1 tablespoon extra virgin olive oil over medium-high heat. Add the lamb. Cook, breaking up the meat with a wooden spoon, until evenly browned, about 5-7 minutes. Using a slotted spoon, transfer the lamb to a plate. Drain off and discard the fat. Place the skillet back on the stove and reduce the heat to medium. Add the remaining tablespoon of olive oil, along with the onions, carrots and celery. Season with salt and pepper. Cook, stirring occasionally, until the vegetables are tender, about 5 minutes. Add the garlic and bay leaf. Cook, stirring, until fragrant, 30 seconds. Add the tomato paste and give it a good stir to combine. Pour the wine into the skillet and bring to a boil, scraping up the brown bits on the bottom of the pan. Slide the lamb back into the pan and cook until most of the wine is absorbed. Scrape everything to one side of the pan and then pour the tomatoes and their juices into the other side. Using kitchen scissors, roughly chop the tomatoes. Give everything a good stir, then sprinkle in the cinnamon and some more salt and pepper. 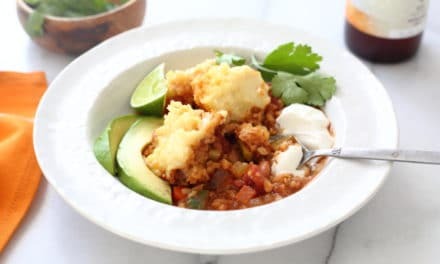 Cook at a brisk simmer (adjusting the heat as necessary) for 15-20 minutes—stirring occasionally and breaking up the meat and tomatoes with a wooden spoon—until the vegetables are tender. Taste and season with additional salt and pepper as needed. Discard the bay leaf. 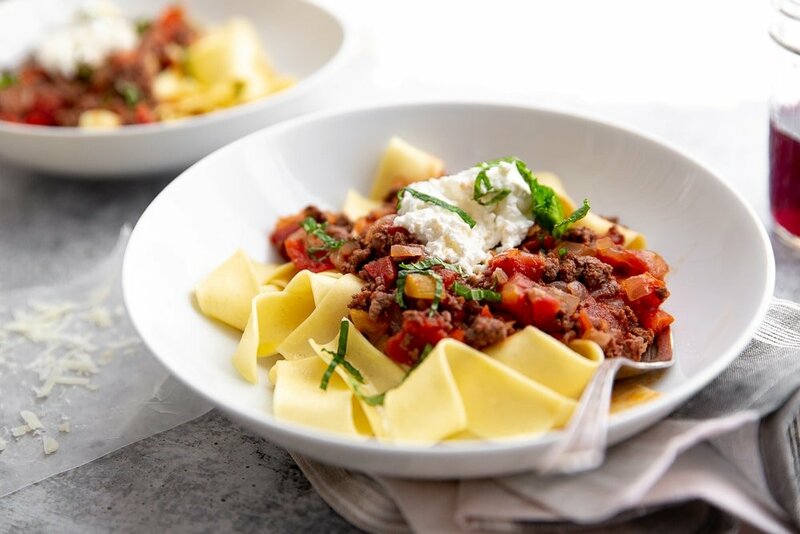 Do Ahead: The ragu can be refrigerated for up to 5 days or frozen for up to 3 months. Reheat gently before serving. In the meantime, bring a large pot of water to a boil. Season the water with salt. Cook the pasta until just shy of al dente. Reserve 1 cup of the pasta water. Drain the pasta, then transfer it back into the pot. Add the ragu. Cook over medium heat, stirring the pasta to coat in the sauce, 1-2 minutes (or until the pasta is cooked through). Add some of the pasta water as needed to create a nice sauce (it should look a tad watery in the pan, as the sauce will continue to absorb once it’s plated). Remove the pot from the heat and stir in the grated Pecorino Romano cheese and the mint. 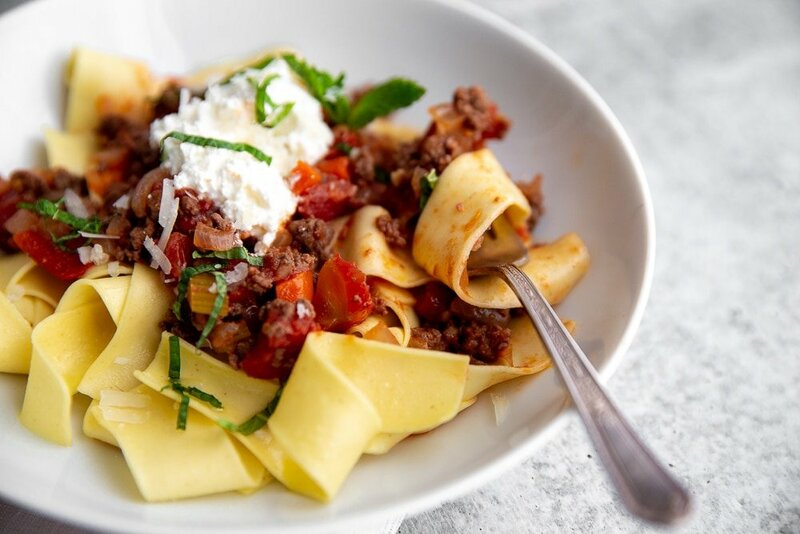 Twirl the pasta into shallow bowls and top with a bit more sauce and a dollop of fresh ricotta cheese. Drizzle good quality olive oil over the ricotta and sprinkle with mint. Serve with more Pecorino Romano on the side for grating. Devour. 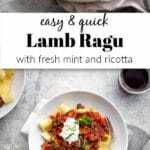 The ragu can be refrigerated for up to 5 days or frozen for up to 3 months. Reheat gently before serving. PreviousHow to Make Green Sauce: an easy (clean-out-the-fridge) herb sauce!